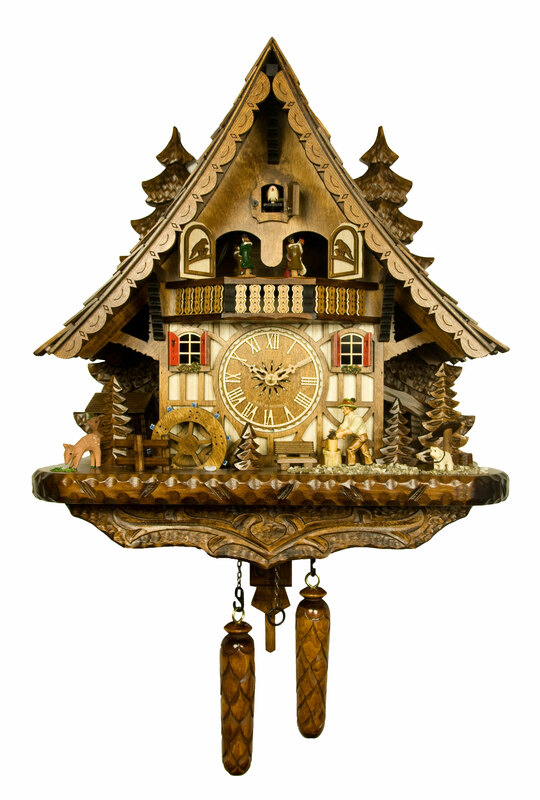 This cuckoo clock has a typical Black Forest house with a shingled roof and is surrounded by hand-carved fir trees. The wood cutter chops wood on the hour in time to the cuckoo call and its echo. One of 12 different alternating melodies follows, while the water wheel turns and the figurines wearing their Black Forest traditional costume dance around to the music. A light sensor automatically turns off the cuckoo sound and the music at night, or they can be turned off anytime by means of a manual switch. wooden dial, diameter 3.5 Inches (9 cm).